Most hand reared bird species, including all corvid species, should be soft released. This applies to adult birds too, who have been in captivity for longer than two weeks, or who are being released at a site distant from the location where they have been originally found, which is occasionally necessary, when this location is not deemed suitable or safe. Soft release involves continuing care for animals at the release site. This includes in particular backup feeding and shelter and requires a greater commitment of time and effort than a hard release usually does. Soft release is particularly important for hand reared species, which need to learn about their surroundings and need to learn appropriate survival skills such as hunting or foraging. This method also allows previously hand reared birds to become fully independent, as no animal should be released when still dependent or too trusting towards humans or domestic animals. Hard release is a release form in which an animal is simply allowed to exit a transport container, or is let go from the hand with no further care or feed provision. It is most appropriate for juvenile, premature and adult animals, which have been held in captivity for only a short time, for hand reared birds of some selected species like swifts, swallows and martins and for animals being released back into their own territory. It is well known and generally accepted that many bird species benefit from being raised and released in groups. 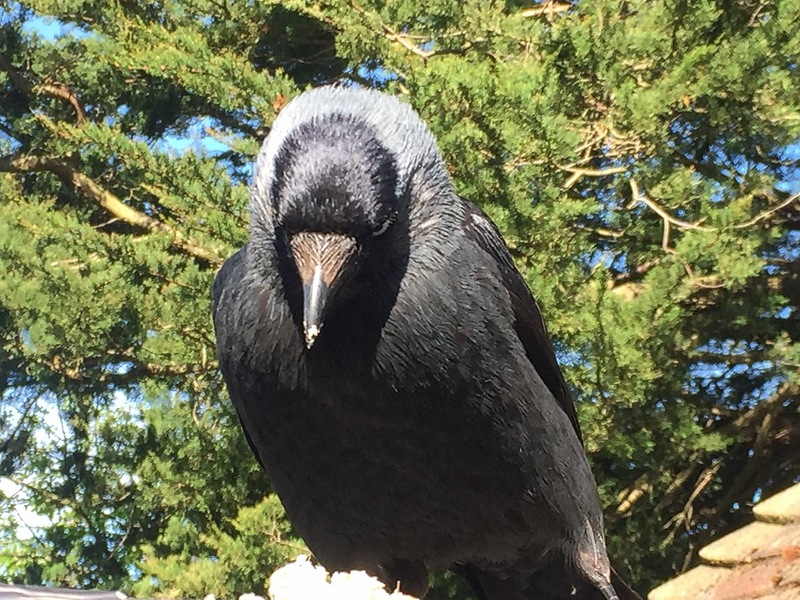 This also applies to corvids, who are best released in mixed age groups containing for example hand raised juveniles as well as experienced premature or adult birds. Corvids should not be raised without adequate company, as it is otherwise almost impossible to avoid imprinting. Imprinting can be a big risk factor, and can potentially reduce the survival chances markedly, depending on the degree of imprinting and the chosen release type. A reversal of imprinting is often but not always possible, but requires experience as well as long-term care and rehabilitation facilities. Although it seems obvious to release birds only with a perfect plumage condition, it is sadly not a common or consistent practice, and seems to be unintentionally and sometimes even intentionally neglected. Birds with nutritional deficiencies can feature a leucistic plumage appearance, which can remain within acceptable limits for quite a long time, in particular whilst these birds are being kept in a safe captive environment. However, this kind of fragile plumage will often deteriorate rapidly, after these birds have been prematurely released. As soon as these birds will face the elements and the stress of the normal live in the wild, they most certainly will be rendered flightless very much soon. A premature release is condemning these birds to a prolonged suffering and death. This kind of postponed plumage deterioration, and other primarily invisible internal problems like hepatic steatosis, can also occur in birds, who have been raised on a wrong or suboptimal diet. Goldfinches, swallows, martins and swifts are prime examples for this problem, but corvids can be affected as well. In this context it is also important to understand the different moulting patterns of individual bird species, which determine potential release dates. It might be necessary for some birds to stay at least on year in captivity to give them a chance to go through their first complete moult in the following summer, before these birds can be safely released. 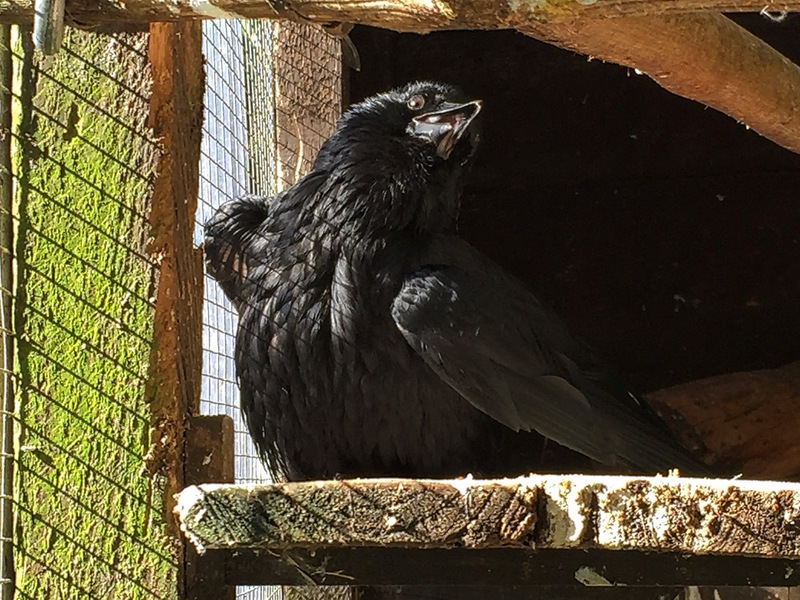 Generally speaking, juvenile corvids and long-term adult bird patients should not be released during their respective breeding season, as there is a high risk of being attacked or harassed. Mixed age release groups work well, as for example premature or adult birds have a big advantage due to their acquired knowledge, which includes the knowledge of local geography and direct contact to birds from the neighbourhood. By creating mixed age release groups, birds will learn from each other and will start forming bonds, friendships and alliances, which will give them a head start in the wild. 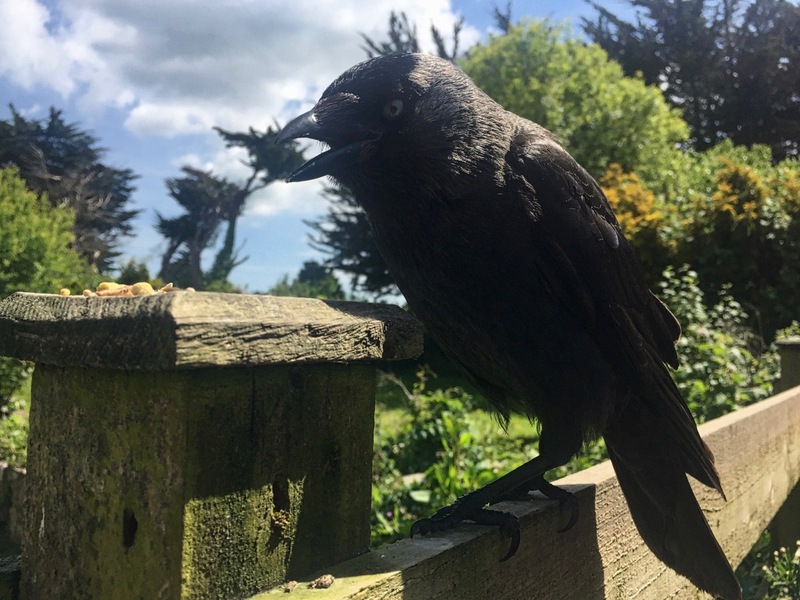 Depending on their individual development, jackdaws can be soft released shortly after the breeding season, which is usually by the end of July and the beginning of August. 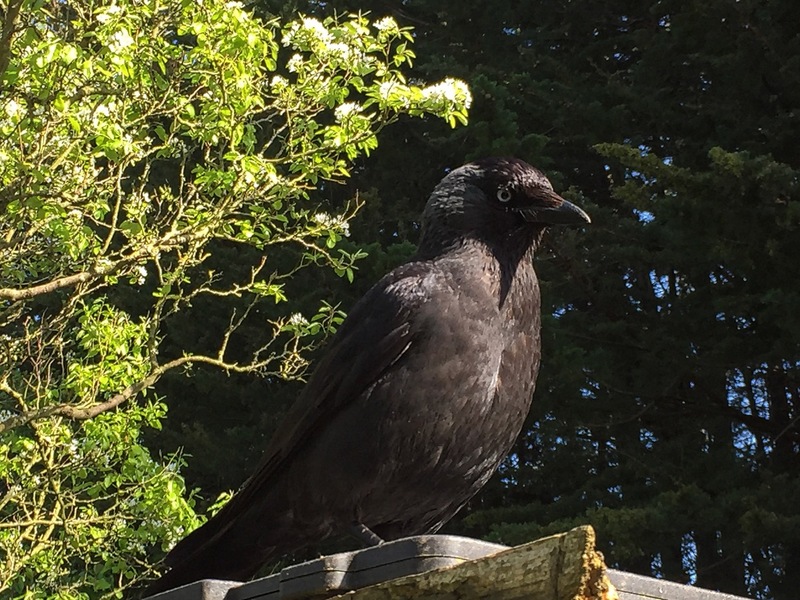 Finding a good release location is usually not a problem, as most locations are suitable, as long as there are other jackdaws or mixed jackdaw and rook groups around, and birds are not released into an occupied crow or magpie territory. If there is a need for, then juvenile hand raised jackdaws can be successfully mixed together with juvenile jays or magpies. However, this needs to be carefully monitored, as juvenile birds might have been previously attacked by adult birds of these species, which will often understandably cause problems like bullying or fighting. 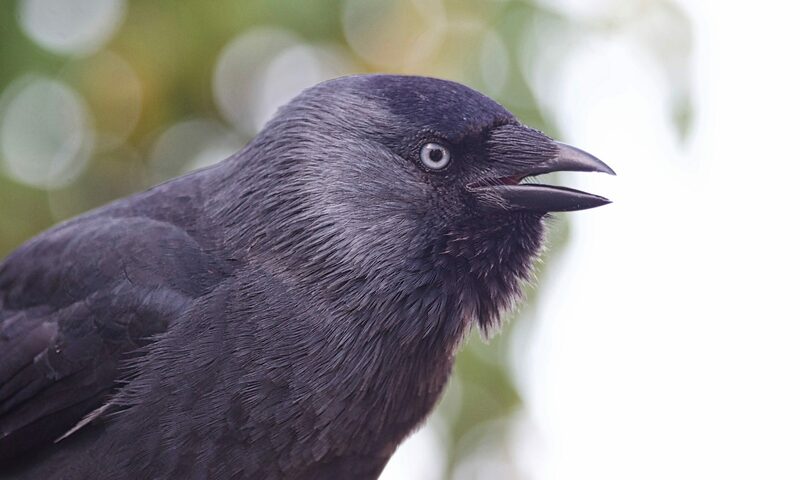 Adult jackdaws will usually not tolerate jays and magpies very well, and therefore these species need to be released in separate groups. Carrion crows and rooks can be released by the end of September and the beginning of October, usually as mixed species and mixed age groups. Although the actual breeding season finishes slightly earlier, the parenting duties do continue for several months to come. However, in late summer and early autumn, social interactions are becoming more relaxed and adults are going to focus more on themselves, being for example more occupied by their own moult, which means that there will be less aggression and dominant behaviour. This situation gives youngsters also more time to get the strength, social knowledge and confidence they require to be sufficiently prepared for their lives in the wild. The release process usually takes several weeks and can last as long as to the end of November. Corvids in general, but in particular crows and rooks, usually need their time to make up their minds. Birds, who have not left the release aviary by the end of November, or have come back inside the release aviary again, are usually better off to stay another year. In our experience the decision to leave the release aviary is often a matter of confidence. One or even sometimes two years can make a big difference, and a situation which did not look promising to begin with, might look completely different one or two years later. This is particularly true for small birds and birds showing a delayed development, who often need one year and sometimes longer to catch up with their stronger siblings. By the end of November the aviary doors will be closed. However, backup feeding will continue as long as needed. Release aviaries for carrion crows are best located outside or at least on the fringes of an occupied crow or magpie territory. 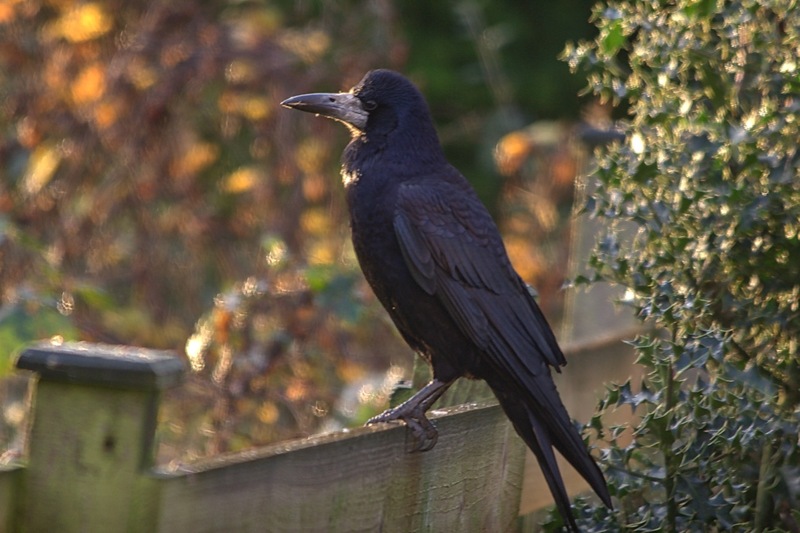 The size of crow territories seems to vary slightly, being usually smaller during than outside the breeding season. It is also worth knowing that geographically crow territories do not change over time, only occupier do change. It is of big advantage when there is a territory nearby, which is not occupied by the breeding pair, but by a group of non-breeders. This enables young birds to join a group of their own kind and to enjoy the protection of this group, which is also ideal for their further social development. Areas close to rookeries are suitable release places too, and are also very useful prior to the release, as the potential release candidates inside the aviaries will benefit from social interactions with local visitors. Another advantage is that occupied crow territories and rookeries are also usually not very far away from communal roosts, which are the hubs of the social lives of corvids. Release aviaries are flight aviaries by definition and should be as big as they possibly can, as all release candidates need to built up their flight muscles and need to gain general strength. Ideally release aviaries should mimic the natural habitat to allow birds to engage in natural behaviour and to learn for example to forage or to cache food. Half of the roof should be covered for shade and shelter whilst the other half should let in sunlight and rain. Waterproofing is also an important aspect of getting birds ready for release and fit for the wild. The aviary space should ideally incorporate trees and vegetation in and around the enclosure, as well as areas with natural flooring, tree stems, windbreaks and natural perching.